Joseph Smithson has been a full-time gunmaker since 1985. He began his education in gunsmithing at Trinidad State Junior College. Smithson expanded his custom gunmaking knowledge while working under the tutelage of master gunmaker Jerry Fisher, and has been building highest quality guns and rifles in his own shop for the past twenty years. 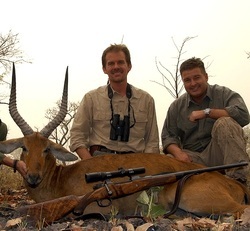 Smithson works with both the wood and metal on bolt actions, single shots, double rifles and shotguns. He is also well known for his quick detachable scope mounting system, which have been sold to other gunmakers and customers throughout the world. Smithson now lives in Utah where he and his son Brett have their shop.